Here is another gift of designer yarn that, left to my own devices, I might never have found my way to experiencing. 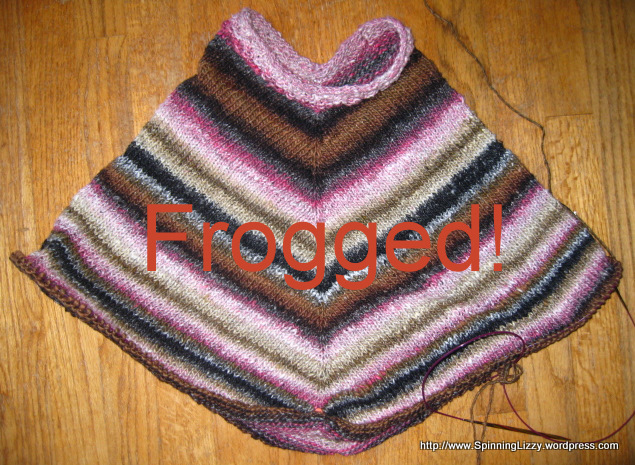 I have recently been consumed with knitting, and find I spend an inordinate amount of time knitting, frogging, and re-knitting. I’ve come to the opinion that spending so much valuable time to knit something from an idea into existence deserves yarns that are “perfect”, rather than “make do”, even if it means having to splurge extravagantly. For now, as my stash still brims with gorgeous gifts, I am diligently divining their perfect destinies; but I do look forward to Some Day, (when said stash is under control), when I may finally choose the project first, and only then shop for the ideal fibre to suit. 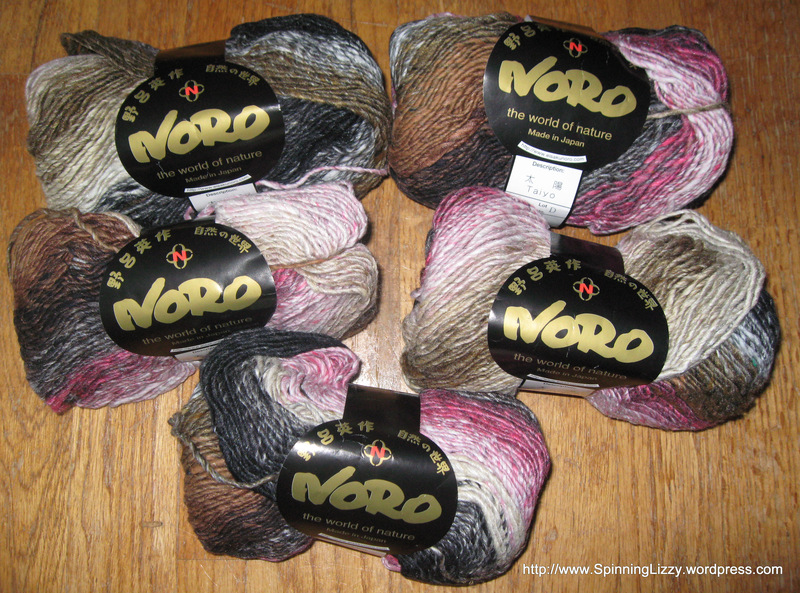 Comprised of cotton, silk, wool, and nylon, Noro Taiyo has some very natural colourways; and I can see myself in this rustic, bohemian yarn, curiously named “Colour 1”. 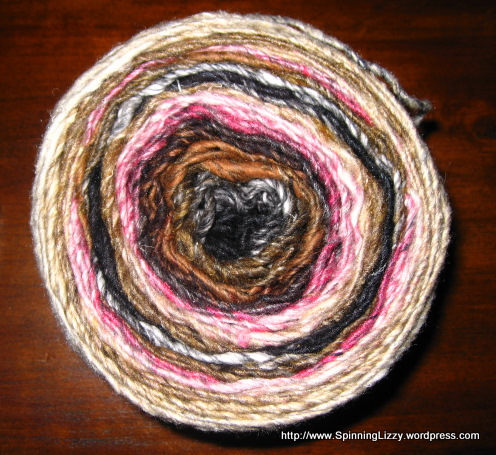 This yarn is a good representation of me, as all my eye, hair, blush, and skin tones may be found in each skein. 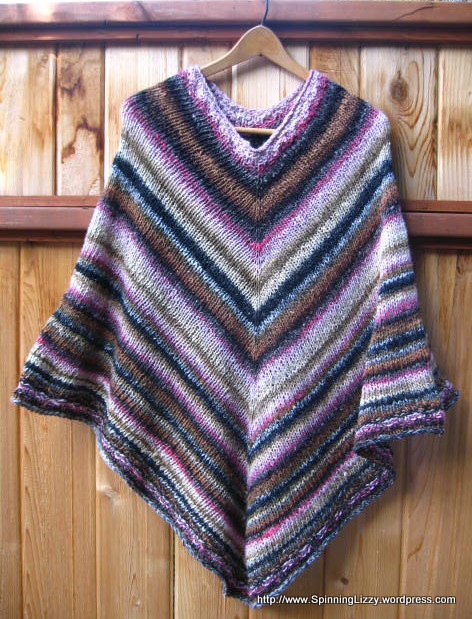 I decided to use Taiyo to knit my latest adventure, Stephanie Pearl-McPhee’s poncho. For such a very simple knit, it seemed as if I would never have it right, and finish; I knit and frogged the neckline three times before settling in to knit the body. Because the yarn is predominately cotton, I imagined it would stretch, and so knit the fabric a little tighter to compensate. When I had knit up two skeins, I had to admit to myself that the resulting stiff and thick fabric was far from what I hoped for: which was a stretchy, drapey, summery cover-up to throw over beach attire when convening with friends around an evening campfire. Just thinking of it, I can hear the laughter and gentle banter, against the background of snapping flames, the scent of burning wood resins, and the feel of the sand’s grit through my fingers. Clearly, this uncooperative cloth was not sharing my reverie! Well, perhaps the yarn did envision the sandy beach in one respect: for intermittently trapped in the yarn were rough bits of straw, bark, and the occasional flake of mineral that had to be tweaked out. Every skein seemed to have at least a dozen such detritus to contend with. This is rustic yarn, indeed! At this point, my project had enough length to be finished as a short poncho, and both DH and DS were loath to (and horrified by!) my resolve to raze two weeks of work. Fortunately, I wield the needles, and had the last word. I made the neckline even larger the last time, as all of the previous attempts had collars that were too close and warm against my skin. 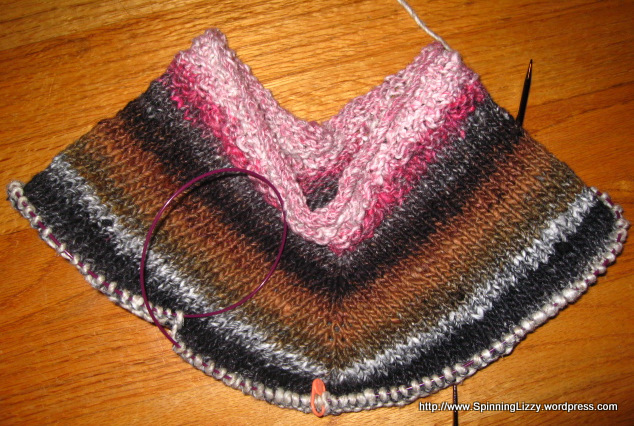 I also switched to larger (US size 10.5) needles for the body of the poncho. 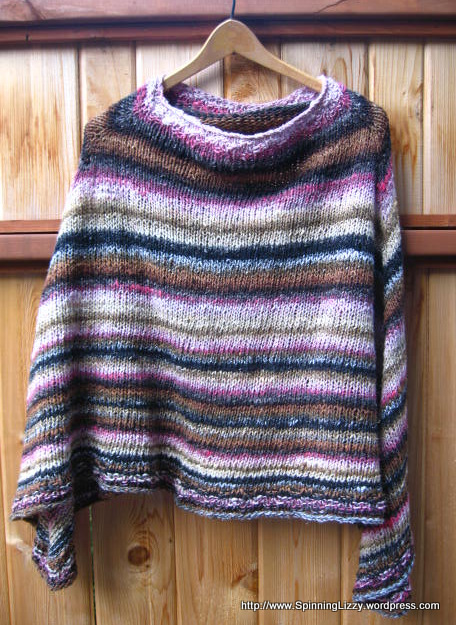 It is slightly larger after washing and blocking, and I hope it won’t continue to stretch. There is a little wool in the mix, so I might attempt to full the garment slightly at some point. I did not want the fringe of the original pattern, so used six rows of moss stitch in the neckline and hem to keep the stocking stitch from rolling up. 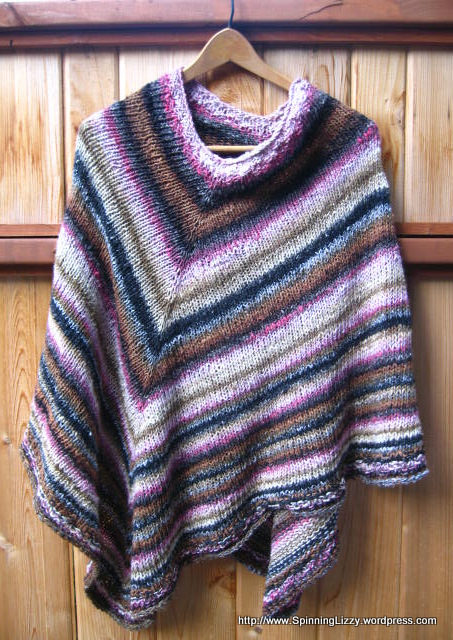 The entire poncho used three-and-a-half skeins of Taiyo. Worn normally, the sides fall slightly below my elbow. For a different prospect, I could keep both arms out of the cold (sporting a horizontal striping), by wearing the poncho sideways. Turning the poncho so that it falls rakishly asymmetrical is my favourite way to wear it. The collar falls a little like a cowl, one arm stays warmer, and I feel oh-so-boho-chic sporting it thus! 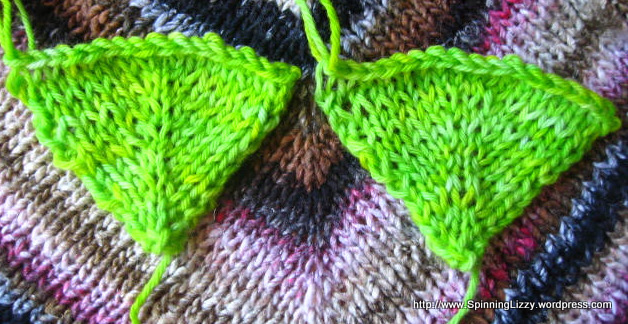 I wish I had thought to check these increases before starting the poncho, but the difference is not so striking that I feel the need to re-knit it!